Cabling without a cable needle can sound really scary. And I’ll be perfectly honest; the first few times I did it, I had some serious heart palpitations. But I promise you, it’s easy once you get the hang of it and will really increase your knitting productivity. It’s very helpful to understand a cable before learning this technique. Most people will tell you that a cable is a twist in your knitting. And while that cables appear that way, the truth is actually a little simpler than that. 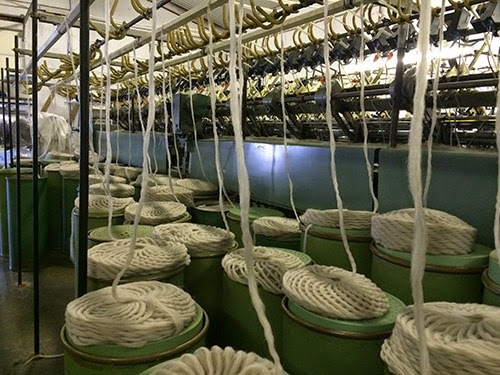 A cable is a change of the order of your stitches – you work stitches three and four and then stitches one and two. If you are looking to learn to cable without a cable needle a good place to start would be with a 2 stitch cable, also referred to sometimes as a ‘twist.’ A great example of this is the waist detail on the Sartell pullovers designed by Cathy Payson knit in Soft Linen from our Classic Fall collection. 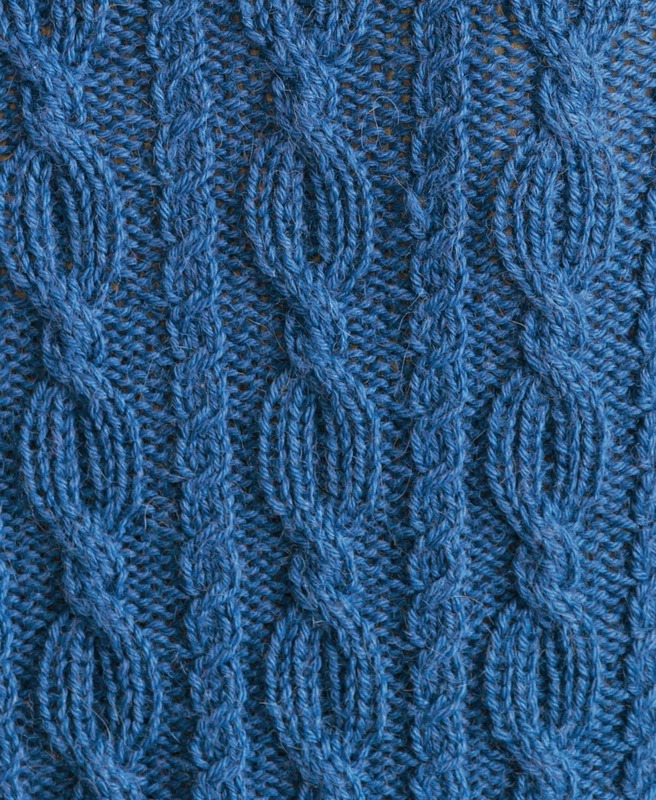 I love this little detail on an otherwise simple pattern. 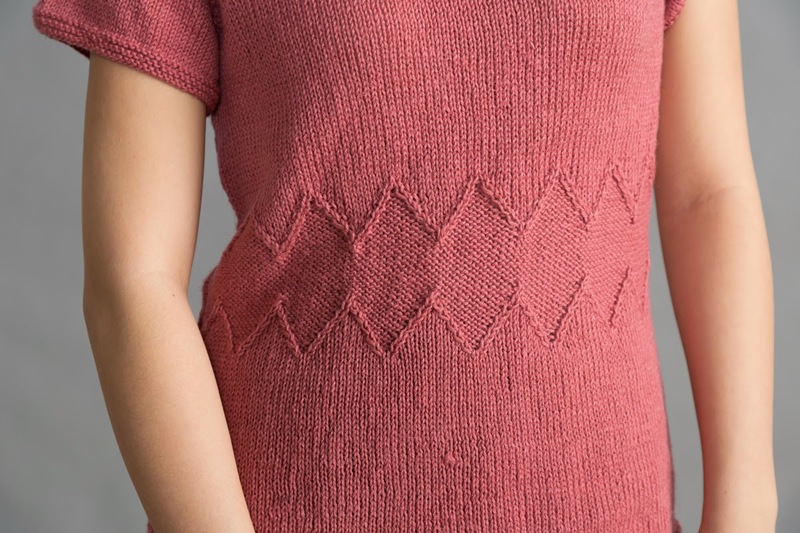 The zig zag mirrors the lines of the raglan shaping, both of which are very flattering. And to top it off there is a diamond on the sleeve of the long sleeved version. When working a cable without a cable needle, you will want to use needles with sharp points. This is one of those “It’s personal and everyone is a little different” things, but having a longer and/or sharper point will help you ‘dig’ out the stiches (you’ll see what I mean in a few pictures). I personally happen to love the Addi Rockets…but again, it’s a personal decision each knitter has to make for him or herself. You want to start by working up to the point in your pattern to where the first twist occurs. For the Left Purl Twist (which happens to be the first stitch we come to in the chart), you will want to put your right hand needle into the BACK of the SECOND stitch. Here comes the leap of faith. Ready? 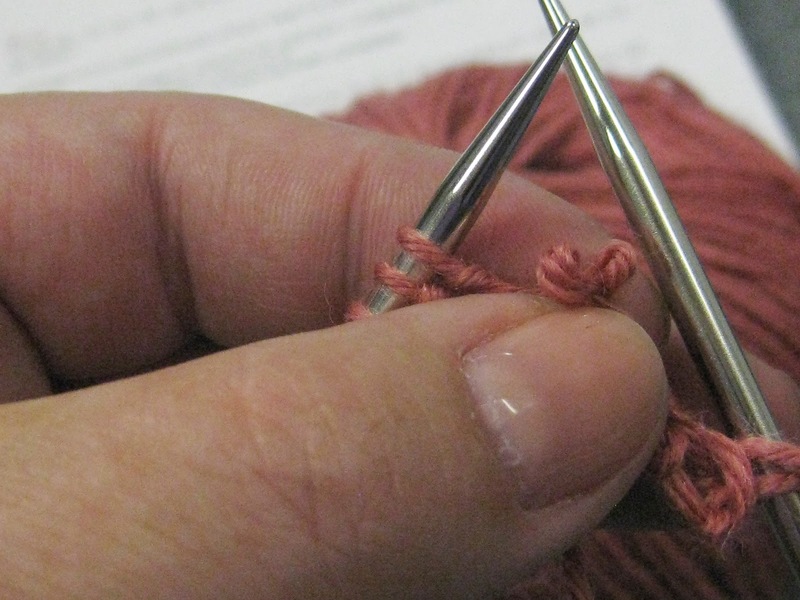 You are going to grasp the two stitches with the thumb of your left hand (which helps keep those two stitches from dropping down) and slip them off the needle. Don’t panic! We are going to put them back on the needle! And quickly! You’ll notice that the stitches are now in reverse order from their original position. This is a good thing. Slip them back onto the left hand needle in the new order. You then want to purl the first stitch and knit the second one. You might notice at this point that everything I am telling you to do is backwards from the written directions in the Sartell pattern. That’s because it is. I know this is another leap of faith, but trust me…it all works out in the end. Phew. I’ll bet that feels good…and maybe a little awkward. 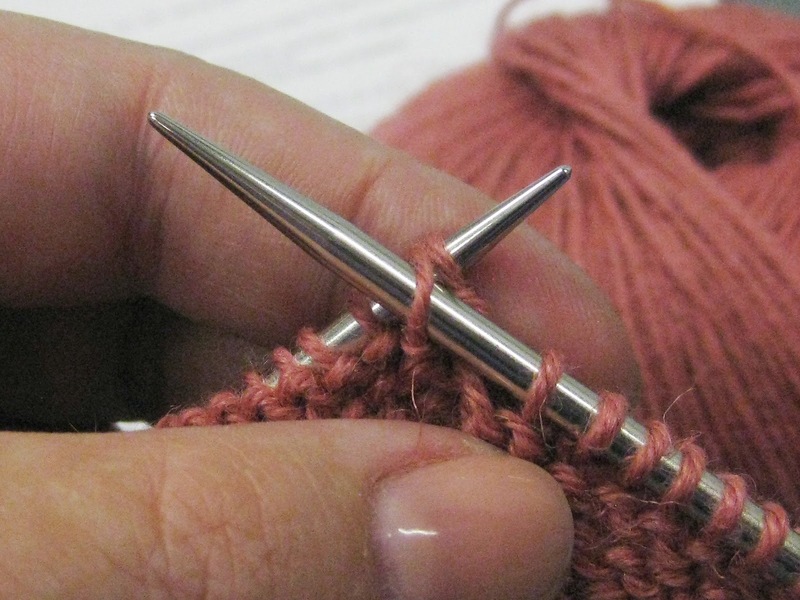 But think back to the very first time you held a pair of knitting needles…that was a strange as well, right? You got the hang of it eventually. And the same is true for this technique. You’ll be flying through these cables in no time. The next cable we come to is a Right Purl Twist. This is very similar to the cable we did above, but in the opposite direction. 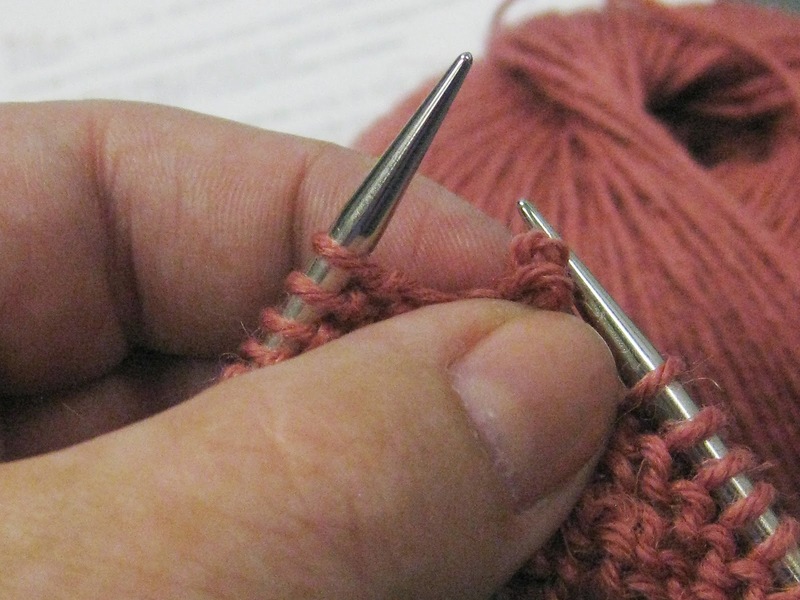 You’ll start by putting your right hand needle into the FRONT of the second stitch. Again you’ll slip both stitches off the needle, pinching them with your thumb to make sure they don’t drop down, and slipping them onto the left hand needle in the new order. On this cable you want to knit the first stitch and purl the second. Now you have finished the first repeat of your chart and get to celebrate by doing it again! And again…until you reach the end of your row. Do you feel like a genius yet? You should! 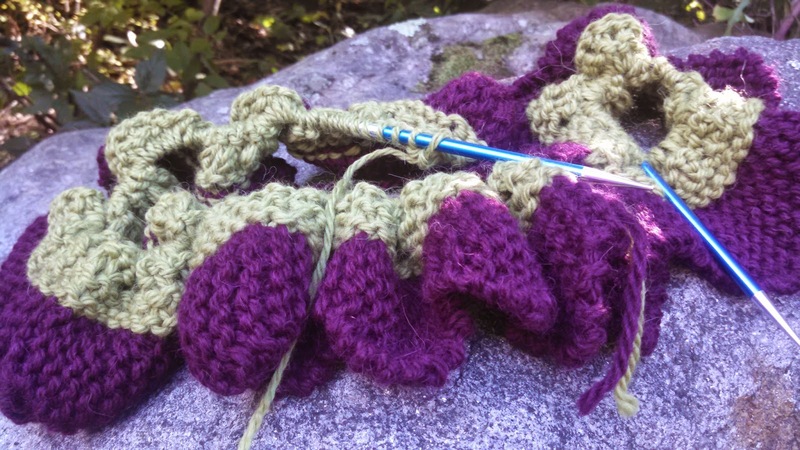 You have defied centuries of knitters that came before you, found a quicker and more efficient way to cable…all while making something pretty! 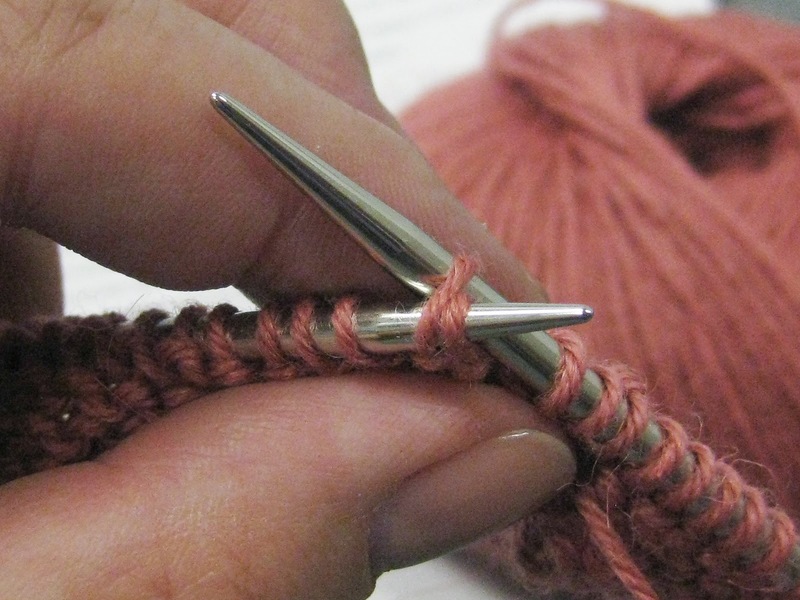 The Left Twist and Right Twist stitches are extremely similar…except they are a little easier. The only difference is no purling. The most important tip I can give you about cabling without a cable needle is to remember that everything is BACKWARDS from the written directions. If the directions say to hold my cable needle in front, I ‘pick’ my stitches from the back side. When the directions tell me to hold my cable needle in back, I grab the stitches from the front side of my work. The directions say I need to purl first and then knit? I knit first and purl second. 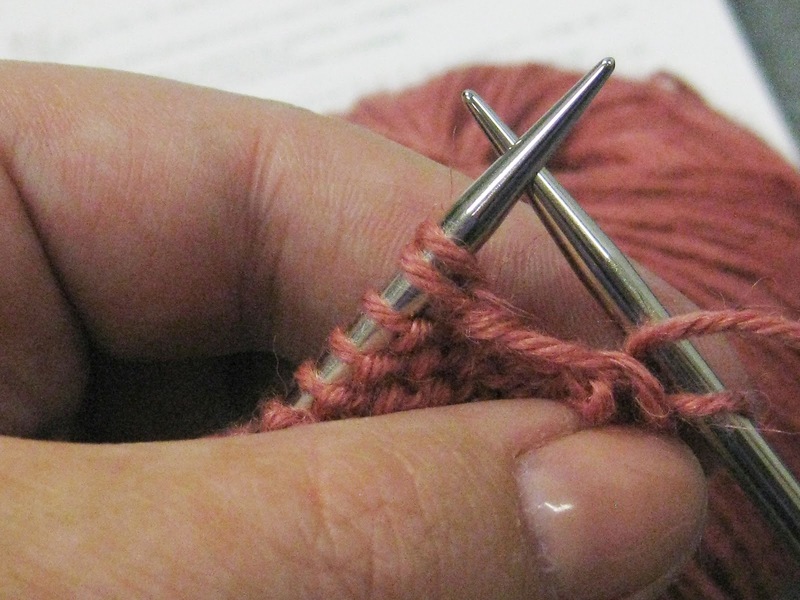 Now that you have the basic of a two stitch cable, you can apply the same technique to a three, four or six stitch cable. The most I personally have ever tried it with is a twelve stitch cable. That was a little challenging…but doable. And there are times where it’s just plain easier to do it the old fashioned way. But it’s good to have the option. In addition to being a leap of faith, this is one of those things that also makes more sense once you actually DO it and not just read about it. I encourage you to pick up your needles and try it for yourself. Most of us at the office are winding down (or binding off) on our Wadenas. But the other day at lunch I noticed that Pattie was just starting hers. 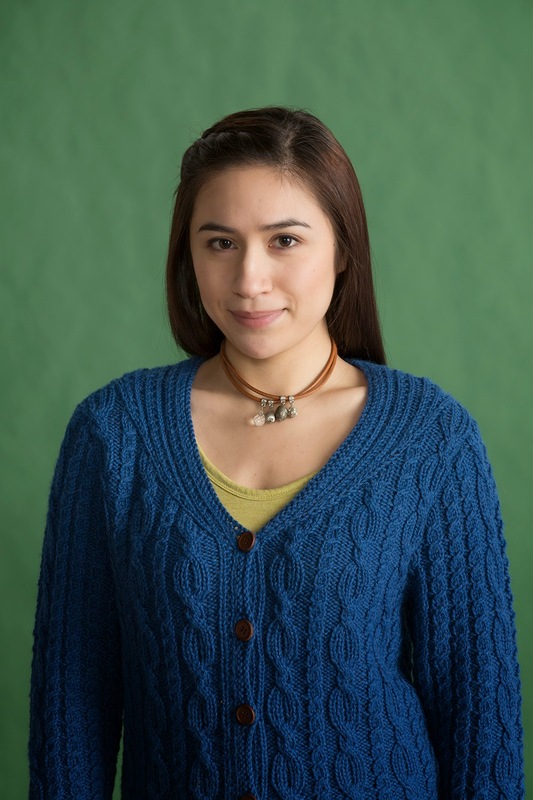 She has been busy knitting on some time sensitive projects and just cast on last week. Luckily this is a quick knit and it won’t take her too long. Like Andi, she decided she wanted to do a solid shawl. Unlike Andi, she decided to use Sanibel. I don’t think I would have thought to use Sanibel for this shawl. I have been in a “this is a fall shawl, therefore I have to use a fall yarn” frame of mind for this KAL, but her choice is brilliant. She’ll be able to wear this shawl year round – in the fall and winter as an accessory to her outfit, in the spring as an extra layer of warmth when she is out and about, and in the summer on cooler evenings or in the AC. I really love the way the Sanibel is knitting up. The subtle stripes of matte and shine in the short rows are stunning. It makes the shawl just a little extra special. Pattie is just starting her short rows now (her first time doing them), but I am confident that she will be binding off before the September 30th deadline. They go quicker than she thinks they will and she has already remarked that she didn’t know why it took her so long to knit a project with short rows. There is still time for you to join us! Read all about the KAL here. I was in a yarn store recently (purely as a customer) and started talking to another customer. She was looking for a sweater to knit for her daughter who was about to graduate from college. She wanted something that her daughter would love and wear for years to come, but not just with jeans, since she was hoping for her daughter to have an office job shortly after graduation. 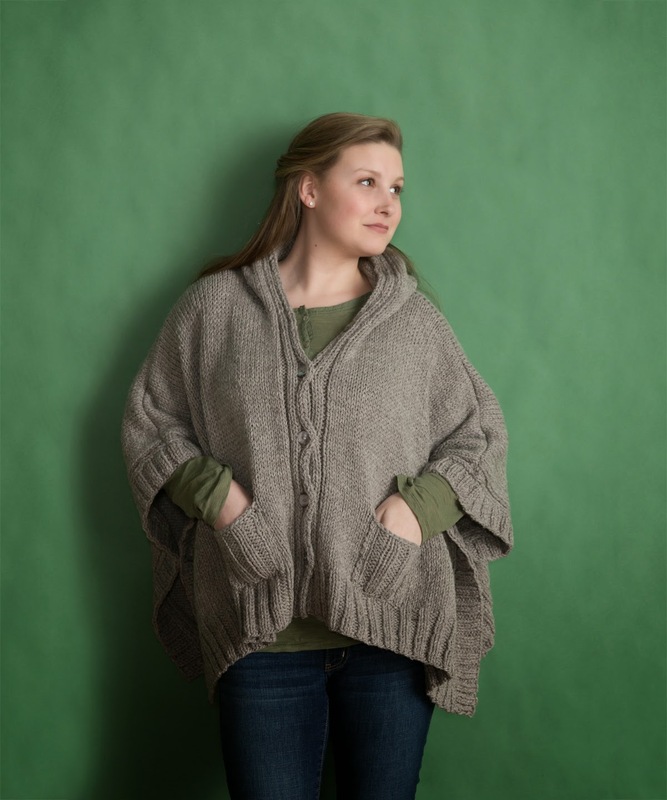 I knew just the project for her - the Perham cardigan by Therese Chynoweth in Inca Alpaca from our Classic Fall collection. I pointed out that it while it would look great with her daughter’s leggings and/or jeans and boots now, it would also be very appropriate with a pair of work trousers or pencil skirt for the office. The knitter/mother agreed. 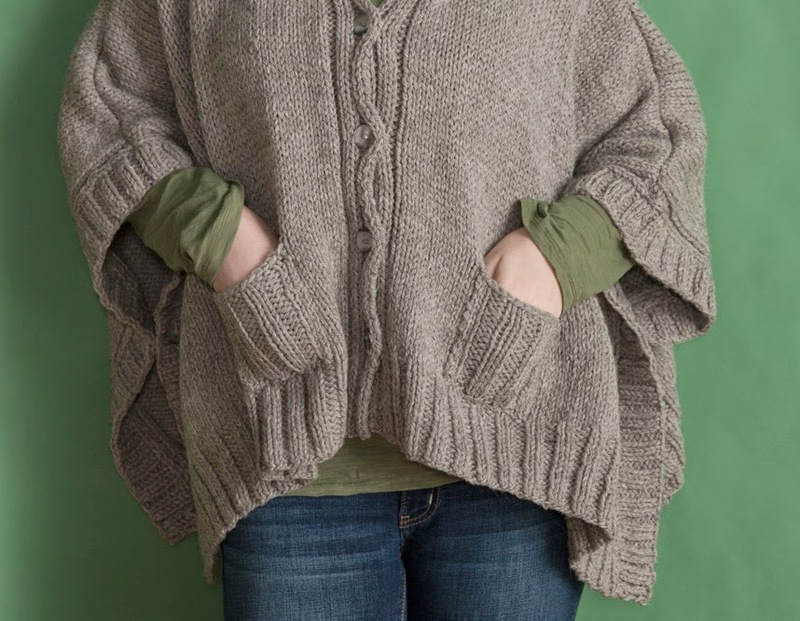 Since she was also looking for a knit that wouldn’t be totally mindless, she really loved the cable pattern on the cardigan. While it looks extremely complicated, it is one of those charts that becomes meditative once you get into the rhythm of it. But the part of the cardigan she liked the best was the neck. At a quick glance, the cardigan has a traditional v-neck. But take a second look. Therese used short rows to create a wider neckline, which is a little more flattering on most people. It also gives the cardigan an updated feel. I turned the knitter/mother over to the store staff and went back to my shopping. But as I left the store, I saw the customer winding her Inca Alpaca and could help but notice the sparkle in her eye. The one we all get when we find the perfect pattern and yarn to start a new project. I have to admit that I had forgotten how good it feels to see that sparkle in another knitter’s eyes, knowing you had a hand in creating it. I miss that about working in a yarn store. Mother/knitter, wherever you are…I hope you are making great progress on your daughter’s cardigan. 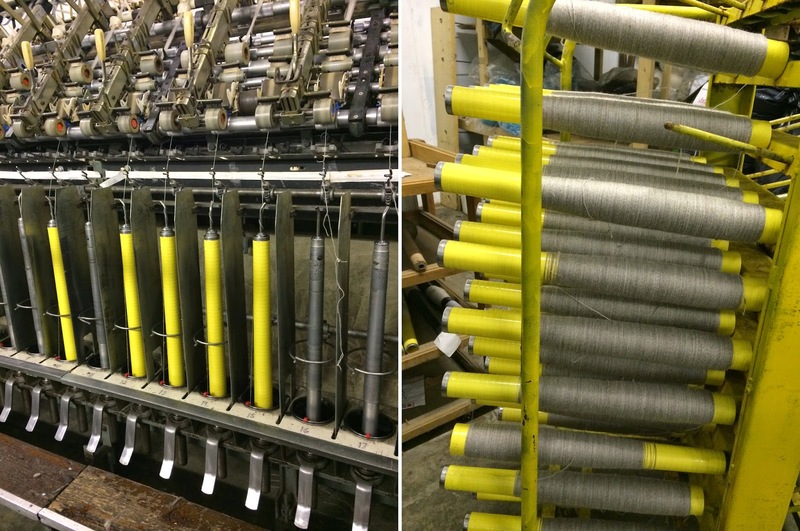 I love, love, love it when we get new yarns in. 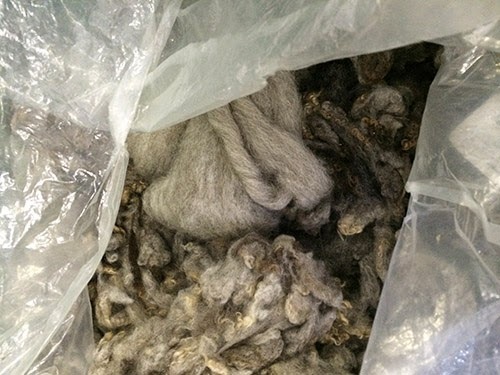 It’s really fun to put my hands on the fiber. I have to touch it for myself, rub it against the skin on the inside of my arms (which is actually more sensitive than most people’s faces) and even smell it. Ok…I know that last one is a little weird. But that’s what I do. 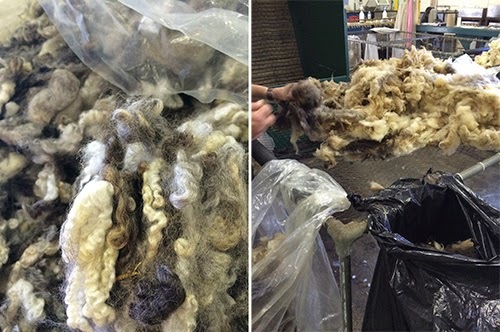 What do I hate about our new yarns? I can’t tell you about it for what feels like an eternity. We started working with the mill on this newest member of the CEY family way back in February. Since then I have been dying to tell someone – anyone – about it. But as always I have been sworn to secrecy…until now! 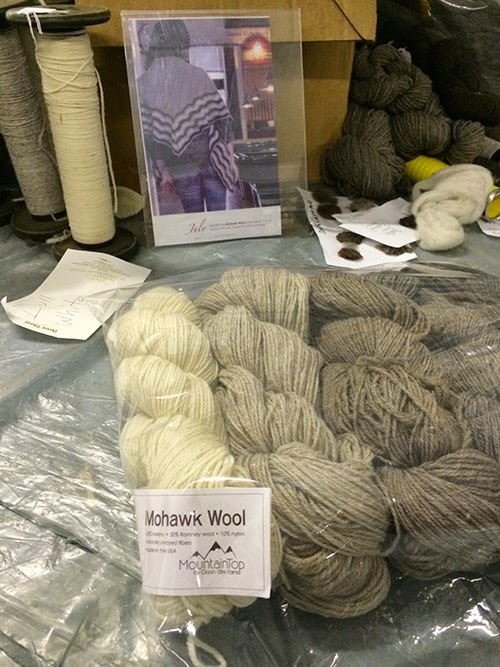 Avalanche is an alpaca, wool and nylon blend that knits up at a bulky gauge. 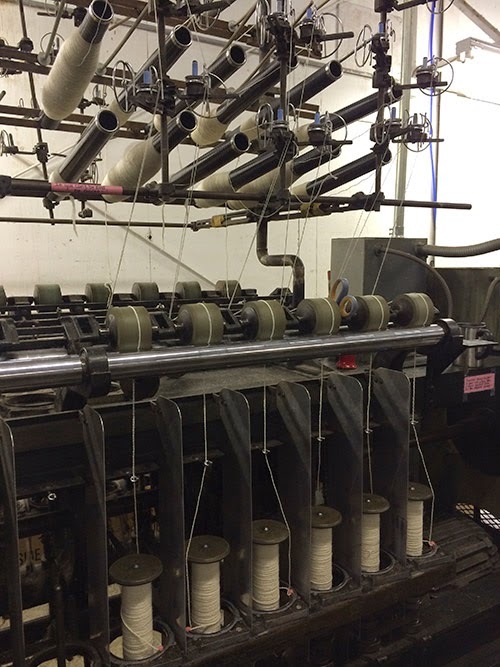 Even though it is a bulky gauge, the yarn itself is extremely light and lofty. In fact, it is so light that a 50 gram hank has 200 yards on it! 200 yards…in a bulky gauge…that’ll go a long way. It comes in eight shades with long color shifts that produce subtle stripes. It has almost a hand dyed feeling to it. But because it isn’t, you don’t have to worry about stranding with Avalanche. I don’t think anyone likes to strand. Now…the most important question - what to do with it? I mean besides just touching it, petting it and in my case, smelling it. Avalanche is an awesome accessory yarn. 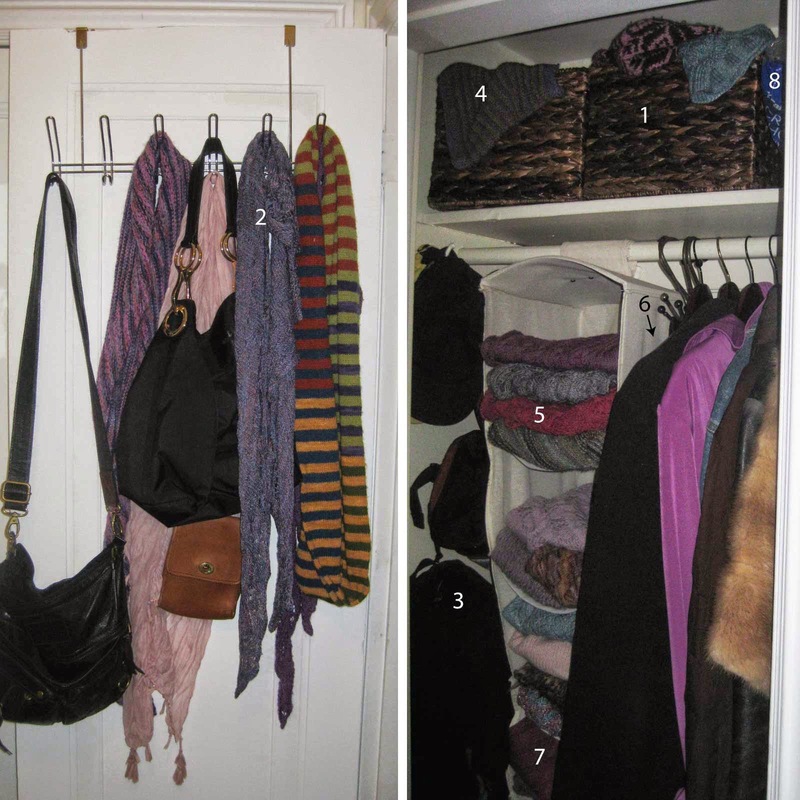 Its scarves and hats will be the ones you want to cozy into on the cooler days of winter, the type you don’t want to take off when you come inside. I am amazed at the stitch definition on this yarn. When I saw it in hanks, I thought “this will make nice garter and stockinette stitch, and maybe a nice seed stitch.” And then I saw the Roseau and Wabasha scarves with their cabled patterns and was excited about how well they popped. We also have two beautiful hat patterns – Windon and Luverne, both of which are sure to keep your ears nice and toasty this winter. 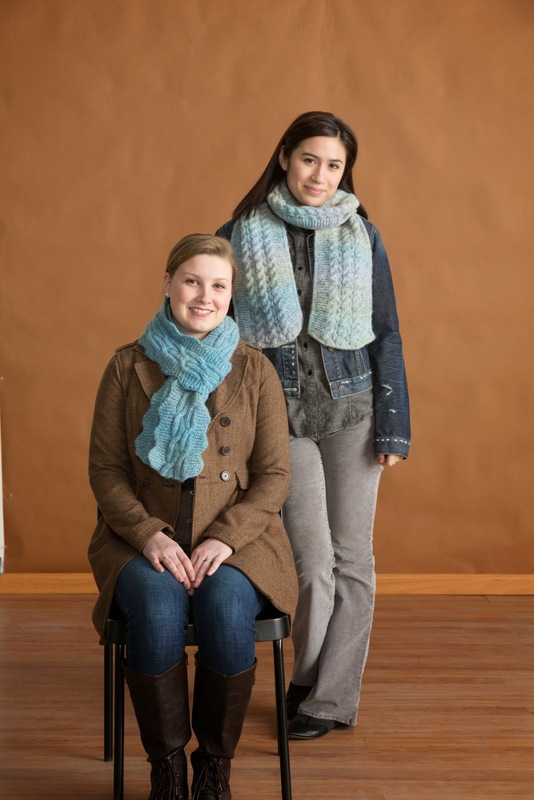 If you are thinking that Avalanche is a great accessory yarn, you are correct. But it also makes amazing sweaters. Case in point: Glyndon and Hawley. 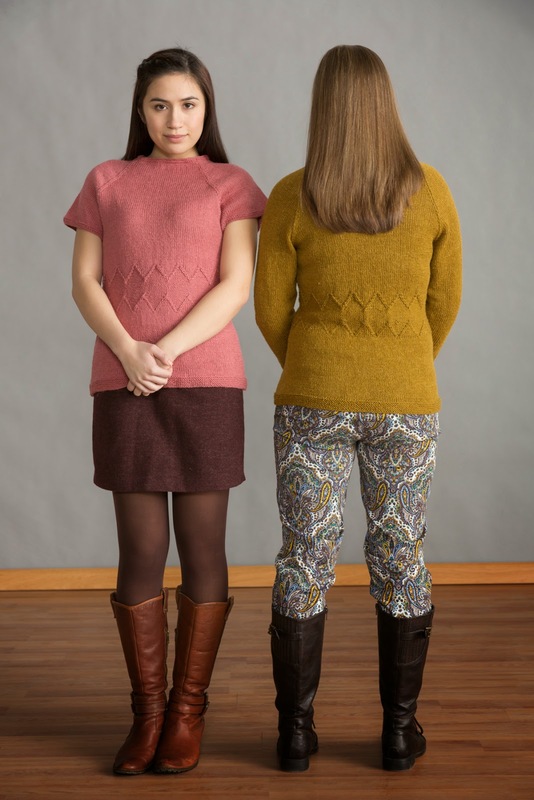 Both are fabulous sweaters that you will want to get on your needles ASAP. All of the patterns in this post are from our Classic Fall collection. The book and yarn are available in LYSs now. Stop by and check them out for yourself. I double dog dare you not to sniff the yarn. There are so many things I love about knitting…feeling the yarn run through my hands, how meditative it is, having a hobby that has a product when you are finished, the community of the knitting world and so much more. 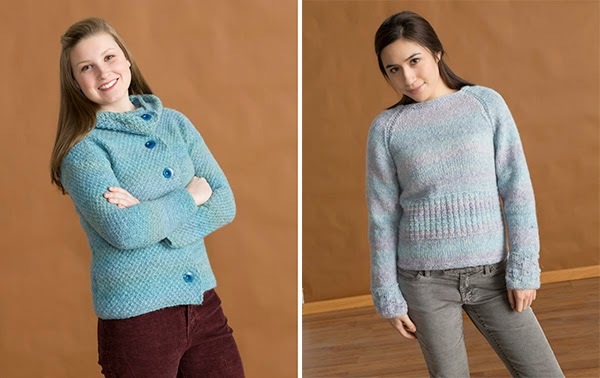 One thing that I always find striking about knitting is that you can take three different knitters who are making the same pattern and come up with three very different results. 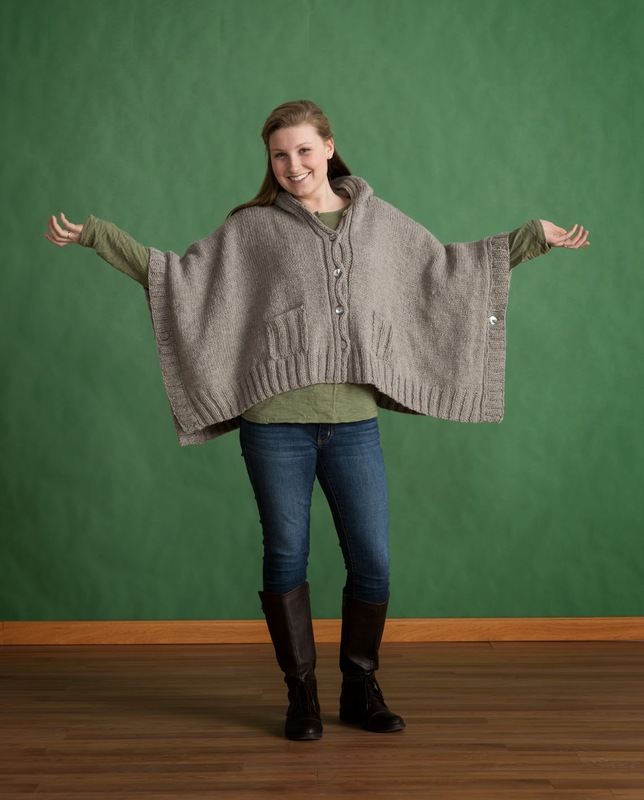 Case in point…the Wadena shawl. 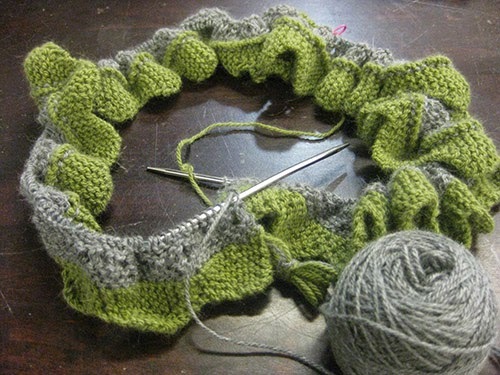 You have already seen progress shots of Tonia’s Wadena and mine, but today I get to show you Andi’s. Andi decided that she wanted a lightweight shawl and only wanted to use one color. After much deliberation she chose Alpaca Sox in Aztec Gold. She has been in love with this color for quite a while now, but didn’t know what to use it for. She knew it would be a great addition to her fall wardrobe. Then she heard about the KAL and knew. She knew that she had to make her shawl out of the Aztec Gold. She has been motoring right along. She finished the border in no time and moved on to the rib very quickly. She is on vacation this week and I suspect that we will see an FO from her when she returns next week. Are you knitting-along with us? Don’t forget to add your project to Ravelry and read all the guidelines for the KAL for a chance to win some awesome prizes. You know it’s unofficially fall when you go to your LYS and see a plethora of new knitting magazines on the table. For me…it really is the happiest time of the year. 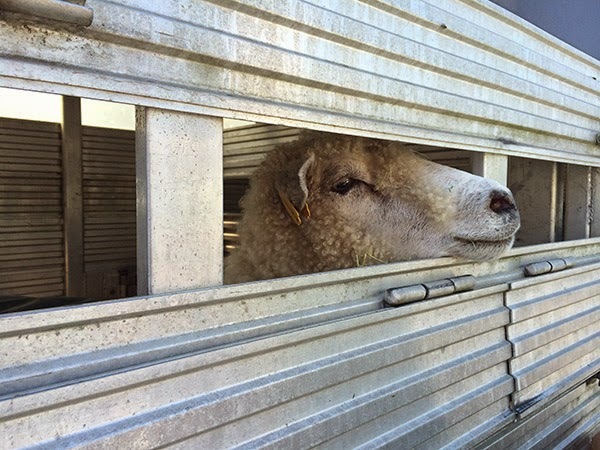 Just thinking about all the wooly goodness (not to mention alpaca and angora too) excites me. When I imagine myself curled up in my favorite chair with my needles, a ball of my favorite yarn (right now it’s a tie between Fresco, Mohawk Wool, Magnolia and Alpaca Sox) and a knitting magazine - it sends me into another stratosphere. One of my favorite things to knit is hats. I always have multiple things on my needles and seem to have a problem with not finishing things (sad, but true). However that is not the case with hats. Since they are small, they go a little faster and I am able to complete them - even with my short attention span. I also love that (for the most part), they don’t require any finishing. No seams, just a few ends to weave in and I am done! But I think the thing I love most about making hats is that they can be simple stockinette, complete cables or even fabulous Fair Isle. The newest issue of Interweave Knits Holiday Gifts features a stunning hat by Carolyn Kern – Rosebud Hat. Carolyn picked two colors of Fresco (5328 Rum Raisin and 5303 Cinder) when designing this beautiful hat. With 43 colors, you are sure to find a combo that will compliment your fall/winter coat. Just make sure that there is enough contrast in the colors for the Fair Isle. Starting with a provisional cast on, there is a nice wide stockinette band that gets folded into the inside of the hat. This serves two purposes – one, it’s an extra layer of warmth for your ears and two, it keeps the back side of the stranding nice and neat when you pull the hat on and off. From there you move on to the Fair Isle section. Because it’s so much fun to watch Fair Isle progress on your needles, it goes faster than you might think. A couple of sittings (at most) and you will have a finished hat! 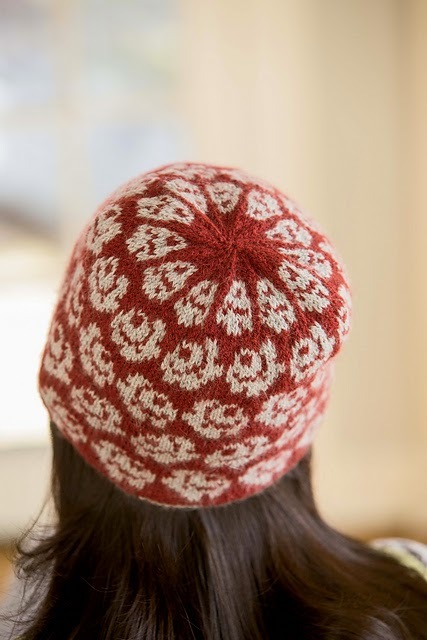 Another Fair Isle hat that I have been thinking a lot about for the past few weeks is our recent web letter pattern – Grapevine Hat. 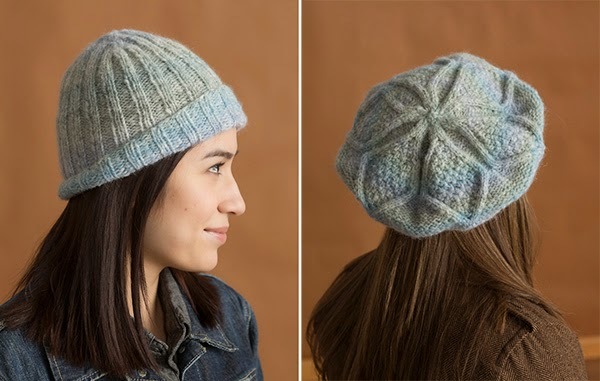 Amy Loberg designed this slightly slouchy hat to be knit in either Fresco or Liberty Wool Light. The gauge is interchangeable and both yarns are perfect for colorwork. Another option is to use Fresco AND Liberty Wool Light combined! 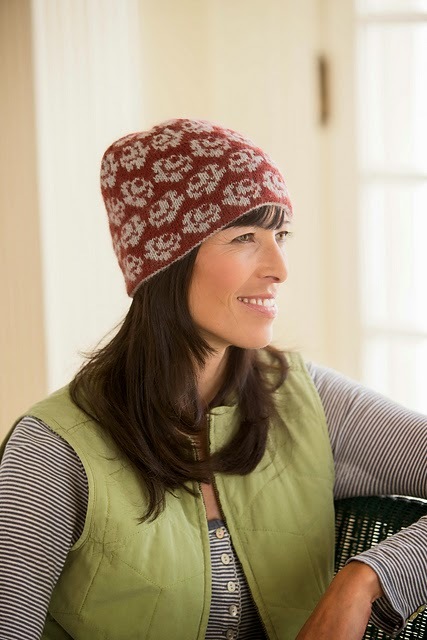 Use Fresco as your main color and one of the Liberty Wool Light Prints for the leaf motifs featured in the hat. The print colorway will do ‘extra’ work for you and make the pattern look more complex than it really is. Or reverse the yarns and have the leaves as the solid color with the print as the background. Fresco has a small amount of haze to it (because of the angora) which will soften the look of the print and give it a slight fuzziness. 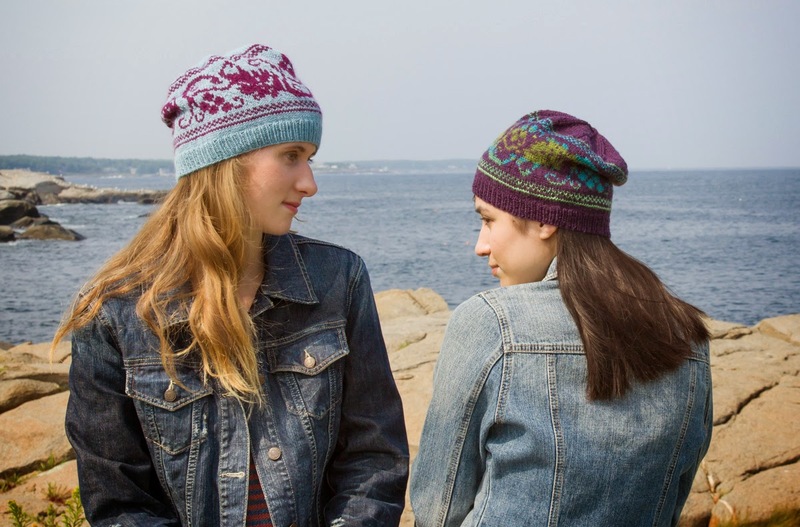 If you are new to Fair Isle then a hat is a good place to start. Most hats are knit in the round and the knit stitch is much easier than the purl stitch in Fair Isle. There are many different techniques, but the one I like the best it to hold one color in your right hand and the second color in your left. It does take a little experimenting to get your gauge consistent on both hands. But once you get it down, you don’t have to worry about twisting the yarns as you go (which means less tangling). Carolyn wrote a great post about the technique here. Make sure to check it out. 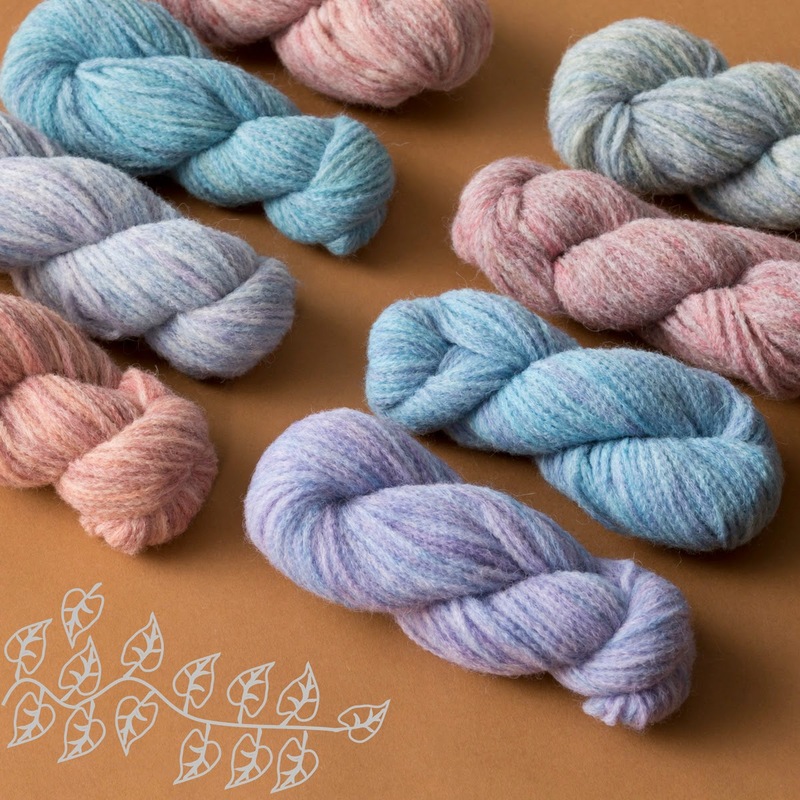 Have you tried Fair Isle yet? What is your favorite method?